A new software supply chain attack unearthed by Windows Defender Advanced Threat Protection (Windows Defender ATP) emerged as an unusual multi-tier case. Unknown attackers compromised the shared infrastructure in place between the vendor of a PDF editor application and one of its software vendor partners, making the apps legitimate installer the unsuspecting carrier of a malicious payload. The attack seemed like just another example of how cybercriminals can sneak in malware using everyday normal processes. The plot twist: The app vendors systems were unaffected. The compromise was traceable instead to a second software vendor that hosted additional packages used by the app during installation. This turned out be an interesting and unique case of an attack involving “the supply chain of the supply chain”. The attackers monetized the campaign using cryptocurrency miners going as far as using two variants, for good measure adding to an expanding list of malware attacks that install coin miners. We estimate based on evidence from Windows Defender ATP that the compromise was active between January and March 2018 but was very limited in nature. Windows Defender ATP detected suspicious activity on a handful of targeted computers; Automated investigation automatically resolved the attack on these machines. While the impact is limited, the attack highlighted two threat trends: (1) the escalating frequency of attacks that use software supply chains as threat vector, and (2) the increasing use of cryptocurrency miners as primary means for monetizing malware campaigns. This new supply chain incident did not appear to involve nation-state attackers or sophisticated adversaries but appears to be instigated by petty cybercriminals trying to profit from coin mining using hijacked computing resources. This is evidence that software supply chains are becoming a risky territory and a point-of-entry preferred even by common cybercriminals. As with most software supply chain compromises, this new attack was carried out silently. It was one of numerous attacks detected and automatically remediated by Windows Defender ATP on a typical day. While customers were immediately protected, our threat hunting team began an in-depth investigation when similar infection patterns started emerging across different sets of machines: Antivirus capabilities in Windows Defender ATP was detecting and blocking a coin mining process masquerading as pagefile.sys, which was being launched by a service named xbox-service.exe. Windows Defender ATP’s alert timeline showed that xbox-service.exe was installed by an installer package that was automatically downloaded from a suspicious remote server. What created xbox-service.exe and pagefile.sys files on the host? Why is xbox-service.exe being launched as a service with high privileges? What network and process activities were seen just before xbox-service.exe was launched? Answering these questions is painless with Windows Defender ATP. Looking at the timeline of multiple machines, our threat hunting team was able to confirm that an offending installer package (MSI) was downloaded and written onto devices through a certain PDF editor app (an alternative app to Adobe Acrobat Reader). The malicious MSI file was installed silently as part of a set of font packages; it was mixed in with other legitimate MSI files downloaded by the app during installation. All the MSI files were clean and digitally signed by the same legitimate company except for the one malicious file. Clearly, something in the download and installation chain was subverted at the source, an indication of software supply chain attack. As observed in previous supply chain incidents, hiding malicious code inside an installer or updater program gives attackers the immediate benefit of having full elevated privileges (SYSTEM) on a machine. This gives malicious code the permissions to make system changes like copying files to the system folder, adding a service, and running coin mining code. Confident with the results of our investigation, we reported findings to the vendor distributing the PDF editor app. They were unaware of the issue and immediately started investigating on their end. Working with the app vendor, we discovered that the vendor itself was not compromised. Instead, the app vendor itself was the victim of a supply chain attack traceable to their dependency on a second software vendor that was responsible for creating and distributing the additional font packages used by the app. The app vendor promptly notified their partner vendor, who was able to identify and remediate the issue and quickly interrupted the attack. The goal of the attackers was to install a cryptocurrency miner on victim machines. They used the PDF editor app to download and deliver the malicious payload. To compromise the software distribution chain, however, they targeted one of the app vendors software partners, which provided and hosted additional font packages downloaded during the apps installation. This software supply chain attack shows how cybercriminals are increasingly using methods typically associated with sophisticated cyberattacks. The attack required a certain level of reconnaissance: the attackers had to understand how the normal installation worked. They eventually found an unspecified weakness in the interactions between the app vendor and partner vendor that created an opportunity. The attackers figured out a way to hijack the installation chain of the MSI font packages by exploiting the weakness they found in the infrastructure. Thus, even if the app vendor was not compromised and was completely unaware of the situation, the app became the unexpected carrier of the malicious payload because the attackers were able to redirect downloads. Attackers recreated the software partners infrastructure on a replica server that the attackers owned and controlled. They copied and hosted all MSI files, including font package, all clean and digitally signed, in the replica sever. The attackers decompiled and modified one MSI file, an Asian fonts pack, to add the malicious payload with the coin mining code. With this package tampered with, it is no longer trusted and signed. Using an unspecified weakness (which does not appear to be MITM or DNS hijack), the attackers were able to influence the download parameters used by the app. The parameters included a new download link that pointed to the attacker server. As a result, for a limited period, the link used by the app to download MSI font packages pointed to a domain name registered with a Ukrainian registrar in 2015 and pointing to a server hosted on a popular cloud platform provider. The app installer from the app vendor, still legitimate and not compromised, followed the hijacked links to the attackers replica server instead of the software partners server. While the attack was active, when the app reached out to the software partners server during installation, it was redirected to download the malicious MSI font package from the attackers replica server. Thus, users who downloaded and installed the app also eventually installed the coin miner malware. After, when the device restarts, the malicious MSI file is replaced with the original legitimate one, so victims may not immediately realize the compromise happened. Additionally, the update process was not compromised, so the app could properly update itself. 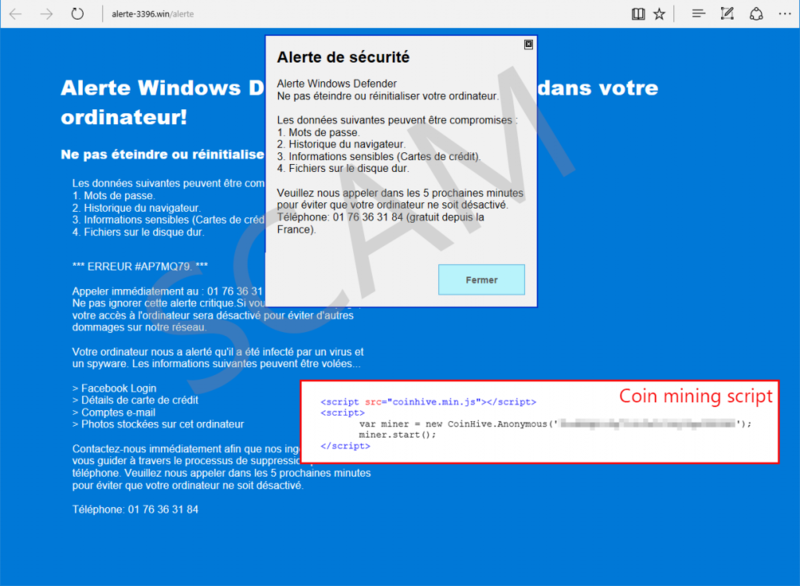 Windows Defender ATP customers were immediately alerted of the suspicious installation activity carried out by the malicious MSI installer and by the coin miner binary, and the threat was automatically remediated. Since the compromise involved a second-tier software partner vendor, the attack could potentially expand to customers of other app vendors that share the same software partner. Based on PDF application names hardcoded by the attackers in the poisoned MSI file, we have identified at least six additional app vendors that may be at risk of being redirected to download installation packages from the attackers server. While we were not able to find evidence that these other vendors distributed the malicious MSI, the attackers were clearly operating with a broader distribution plot in mind. The poisoned MSI file contained malicious code in a single DLL file that added a service designed to run a coin mining process. 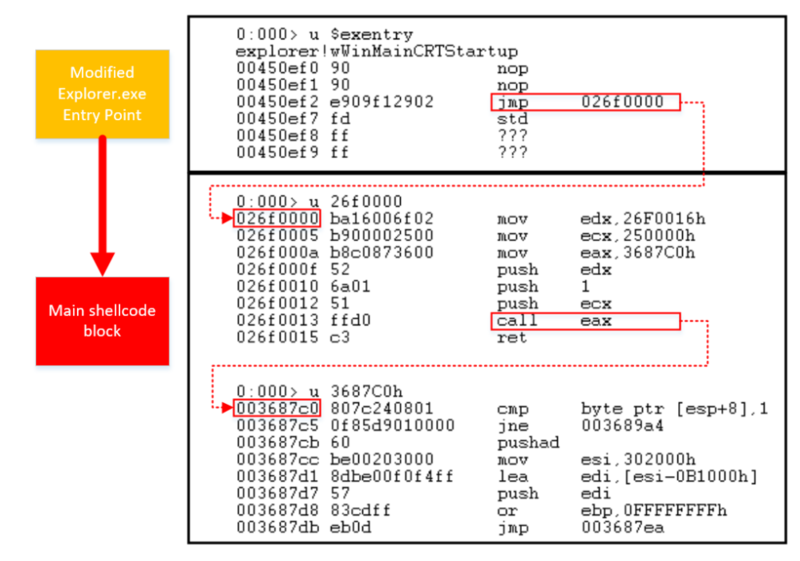 The said malware, detected as Trojan:Win64/CoinMiner, hid behind the name xbox-service.exe. When run, this malware consumed affected machines computing resources to mine Monero coins. Another interesting aspect of the DLL payload is that during the malware installation stage, it tries to modify the Windows hosts file so that the infected machine cant communicate with the update servers of certain PDF apps and security software. This is an attempt to prevent remote cleaning and remediation of affected machines. Inside the DLL, we also found some traces of an alternative form of coin mining: browser scripts. Its unclear if this code was the attackers potential secondary plan or simply a work in progress to add one more way to maximize coin mining opportunities. The DLL contained strings and code that may be used to launch a browser to connect to the popular Coinhive library to mine Monero coins. In early 2017, we discovered operation WilySupply, an attack that compromised a text editors software updater to install a backdoor on targeted organizations in the financial and IT sectors. Several weeks later, another supply chain attack made headlines by initiating a global ransomware outbreak. We confirmed speculations that the update process for a tax accounting software popular in Ukraine was the initial infection vector for the Petya ransomware. Later that same year, a backdoored version of CCleaner, a popular freeware tool, was delivered from a compromised infrastructure. Then, in early 2018, we uncovered and stopped a Dofoil outbreak that poisoned a popular signed peer-to-peer application to distribute a coin miner. These are just some of many similar cases of supply chain attacks observed in 2017 and 2018. We predict, as many other security researchers do, that this worrisome upward trend will continue. The growing prevalence of supply chain attacks may be partly attributed to hardened modern platforms like Windows 10 and the disappearance of traditional infection vectors like browser exploits. Attackers are constantly looking for the weakest link; with zero-day exploits becoming too expensive to buy or create (exploit kits are at their historically lowest point), attackers search for cheaper alternative entry points like software supply chains compromise. Benefiting from unsafe code practices, unsecure protocols, or unprotected server infrastructure of software vendors to facilitate these attacks. The benefit for attackers is clear: Supply chains can offer a big base of potential victims and can result in big returns. Its been observed targeting a wide range of software and impacting organizations in different sectors. Its an industry-wide problem that requires attention from multiple stakeholders – software developers and vendors who write the code, system admins who manage software installations, and the information security community who find these attacks and create solutions to protect against them, among others. For further reading, including a list of notable supply chain attacks, check out our RSA Conference 2018 presentation on the topic of software supply chain attack trends: The Unexpected Attack Vector: Software Updaters. Maintain a highly secure build and update infrastructure. Immediately apply security patches for OS and software. Implement mandatory integrity controls to ensure only trusted tools run. Require multi-factor authentication for admins. Build secure software updaters as part of the software development lifecycle. Require SSL for update channels and implement certificate pinning. Sign everything, including configuration files, scripts, XML files, and packages. Check for digital signatures, and dont let the software updater accept generic input and commands. Develop an incident response process for supply chain attacks. Disclose supply chain incidents and notify customers with accurate and timely information. Deploy strong code integrity policies.Application control can be used to restrict the applications that users are allowed to run. It also restricts the code that runs in the system core (kernel) and can block unsigned scripts and other forms of untrusted code for customers who cant fully adopt Windows 10 in S mode. Use endpoint detection and response (EDR) solutions.Endpoint detection and response capabilities in Windows Defender ATP can automatically detect and remediate suspicious activities and other post-breach actions, so even when entry vector is stealthy like for software supply chain, Windows Defender ATP can help to detect and contain such incidents sooner. In supply chain attacks, the actual compromise happens outside the network, but organizations can detect and block malware that arrive through this method. The built-in security technologies in Windows Defender Advanced Threat Protection (Windows Defender ATP) work together to create a unified endpoint security platform. For example, as demonstrated in this investigation, antivirus capabilities detected the coin mining payload. The detection was surfaced on Windows Defender ATP, where automated investigation resolved the attack, protecting customers. 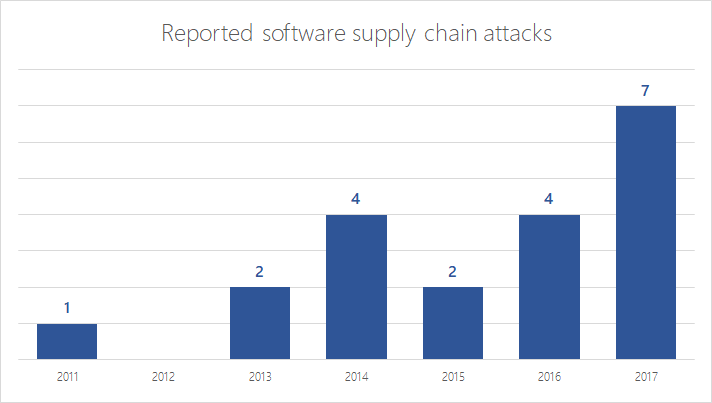 The rich alert timeline and advanced hunting capabilities in Windows Defender ATP showed the extent of the software supply chain attack. Through this unified platform, Windows Defender ATP delivers attack surface reduction, next-generation protection, endpoint detection and response, automated investigation and response, and advanced hunting. Questions, concerns, or insights on this story? Join discussions at the Microsoft community and Windows Defender Security Intelligence. Follow us on Twitter @WDSecurity and Facebook Windows Defender Security Intelligence. Dofoil is a sophisticated threat that attempted to install coin miner malware on hundreds of thousands of computers in March, 2018. 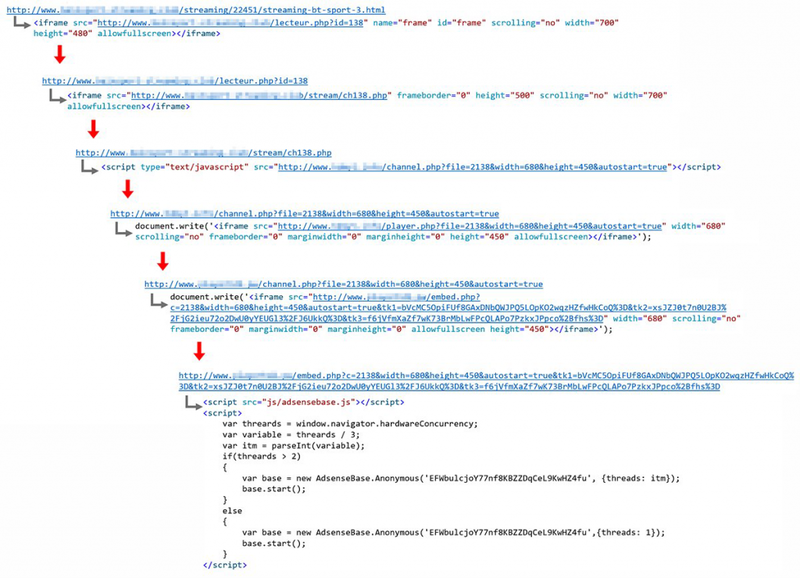 In previous blog posts we detailed how behavior monitoring and machine learning in Windows Defender AV protected customers from a massive Dofoil outbreak that we traced back to a software update poisoning campaign several weeks prior. Notably, customers of Windows 10 S, a special Windows 10 configuration that provides streamlined Microsoft-verified security, were not affected by the Dofoil outbreak. 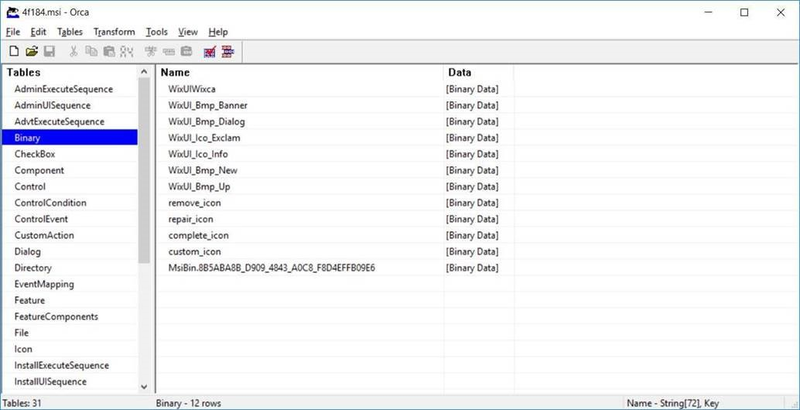 In this blog post, we will expound on Dofoils anti-debugging and anti-analysis tactics, and demonstrate how the rich detection libraries of Windows Defender Advanced Threat Protection and Windows Defender Exploit Guard can help during investigation. We found that Dofoil was designed to be elusive to analysis. It checks its environment and stops running in virtual machine environments. It also checks for various analysis tools and kills them right away. This can make malware analysis and assessment challenging. The following diagram shows the multi-stage malware execution process, which includes checks for traits of analysis environments during some stages. The table below describes the purpose of each stage. The first five stages have at least one or two different techniques that can deter dynamic or static malware analysis. The first three stages (i.e., obfuscated wrapper code, bootstrap module, anti-debugging module) use the following techniques to avoid analysis and identification. Checks for debuggers, and modifies code to crash. This can add additional layer of confusion to researchers, who are bound to investigate the cause of the crashes. It checks for the PEB.BeingDebugged and PEB.NtGlobalFlag fields in the PEB structure. For example, PEB.BeingDebugged is set to 1 and PEB.NtGlobalFlag is set to FLG_HEAP_ENABLE_TAIL_CHECK|FLG_HEAP_ENABLE_FREE_CHECK| FLG_HEAP_VALIDATE_PARAMETERS when a debugger is attached to the process. The first stage contains some benign-looking code before the actual malicious code. This can give the executable a harmless appearance. It can also make the emulation of the code difficult because emulating various API calls that are not present in many malware codes can be challenging. The first-stage code also performs a registry key enumeration to make sure it has the expected value. 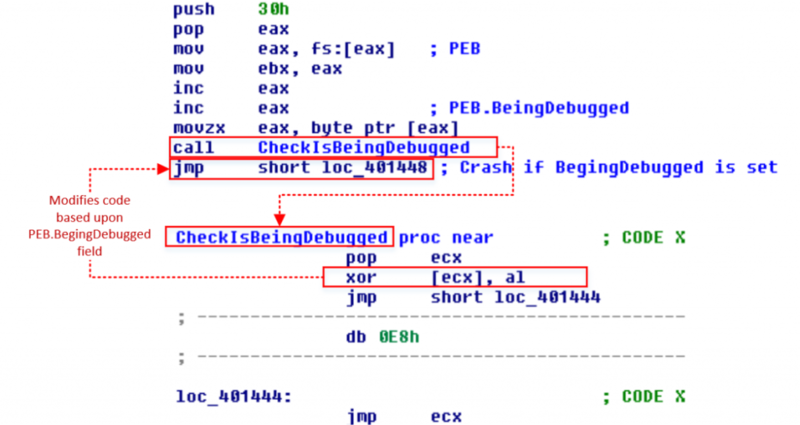 When all checks are passed, it decodes the second-stage shellcode and runs it on the allocated memory. This shellcode un-maps the original main modules memory, and then decodes the third-stage shellcode into that memory this is known as a self-process hollowing technique. Windows Defender ATPs process tree can help with investigation by exposing these anti-debugging techniques. The trojan downloader module performs various environment checks, including virtual environment and analysis tool checks, before downloading the payload. 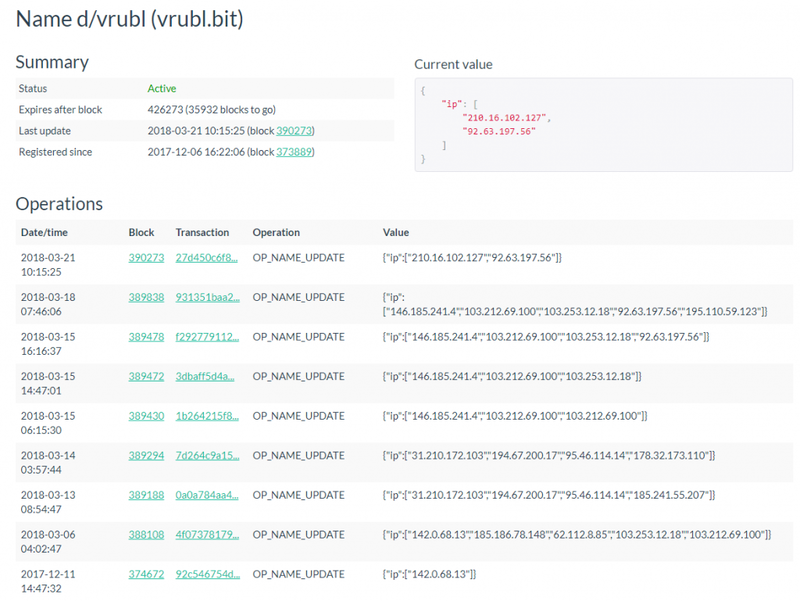 The purpose of this checksum is to prevent malware researchers from quickly figuring out what analysis tools it detects, making analysis more time-consuming. Dofoil heavily uses the process hollowing technique. Its main target for process hollowing is explorer.exe. The Dofoil shellcode launches a new instance of explorer.exe, allocates shellcode in heap region, and then modifies the entry point code to jump into the shellcode. This way, the malware avoids using CreateRemoteThread API, but can still achieve code injection. Windows Defender ATP can detect the process hollowing behavior with advanced memory signals. The following process tree shows that the malware injects itself into explorer.exe using the process hollowing technique. When the shellcode downloads another layer of payload, it spawns another explorer.exe to inject the payload into using process hollowing. Windows Defender ATP can save analysis time on these cases by pinpointing the malicious actions, eliminating the need for guessing what these newly spawned Windows system processes are doing. The process hollowing behavior can be detected through Exploit protection in Windows Defender Exploit Guard. This can be done by enabling the Export Address Filter (EAF) mitigation against explorer.exe. The detection happens when the shellcode goes through the export addresses of the modules to find the export address of the LoadLibraryA and GetProcAddress functions. Adding Windows Defender Exploit Guard EAF audit/block policy to common system processes like explorer.exe, cmd.exe, or verclsid.exe can be useful in finding and blocking process hollowing or process injection techniques commonly used by malware. This policy can impact third-party apps that may behave like shellcode, so we recommend testing Windows Defender Exploit Guard with audit mode enabled before enforcement. Dofoils C&C connection is very cautious. The trojan code first tries to connect to well-known web pages and verifies that the malware has proper and real Internet connection, not simulated as in test environments. After it makes sure it has a real Internet connection, the malware makes HTTP connections to the actual C&C servers. The malware uses NameCoin domain name servers. NameCoin is a decentralized name server system that provides extra privacy backed by blockchain technology. Except for the fact that the DNS client needs to use specific sets of NameCoin DNS servers, the overall operation is very similar to a normal DNS query. Because NameCoin uses blockchain technology, you can query the history of the domain name changes through blocks. Windows Defender ATP can provide visibility into the malwares network activities. The following alert process tree shows the malwares .bit domain resolution activity and, after that, the connections to the resolved C&C servers. You can also view other activities from the executable, for example, its connections to other servers using SMTP ports. 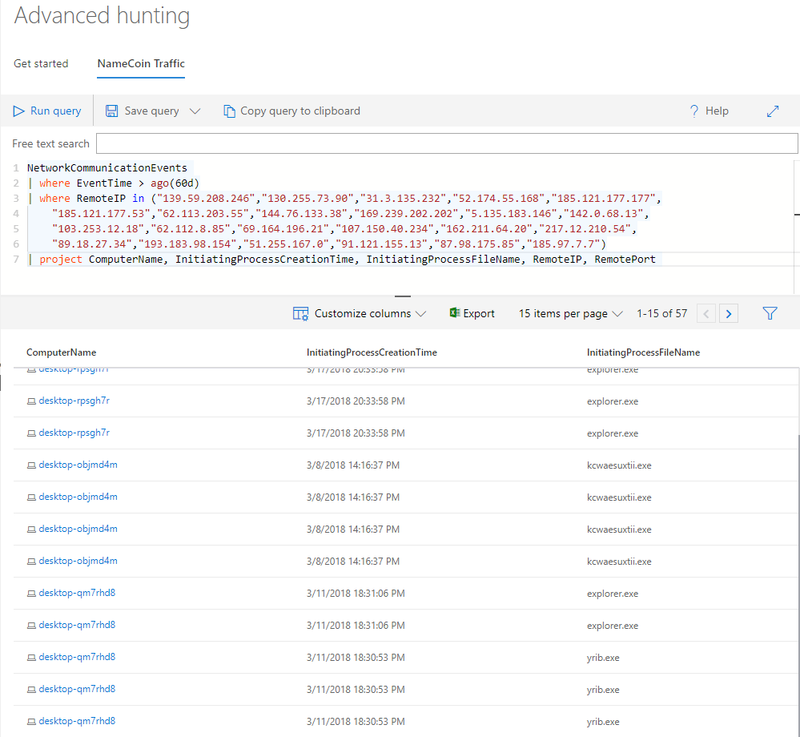 The Windows Defender ATP advanced hunting feature, which is currently in preview, can be used to hunt down more malware samples that possibly abuse NameCoin servers. For example, the following query will let you view recent connections observed in the network. This can lead to extra insights on other threats that use the same NameCoin servers. The purpose of using NameCoin is to prevent easy sinkholing of the domains. Because there are no central authorities on the NameCoin domain name records, it is not possible for the authorities to change the domain record. Also, malware abusing NameCoin servers use massive numbers of NameCoin DNS servers to make full shutdown of those servers very difficult. Dofoil is a very evasive malware. It has various system environment checks and tests Internet connectivity to make sure it runs on real machines, not in analysis environments or virtual machines. This can make the analysis time-consuming and can mislead malware analysis systems. 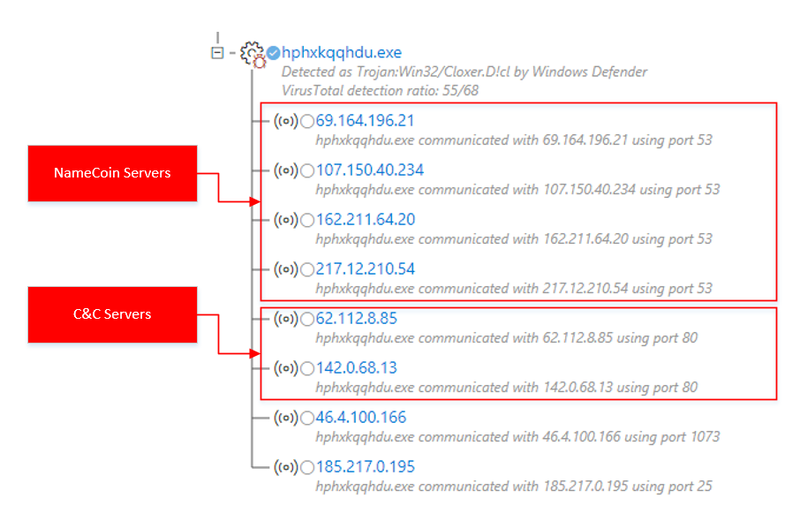 In attacks like the Dofoil outbreak, Windows Defender Advanced Threat Protection (Windows Defender ATP) can help network defenders analyze the timeline from the victim machine and get rich information on process execution flow, C&C connections, and process hollowing activities. Windows Defender ATP can be used as an analysis platform with fine-tuned visibility into system activities when set up in a lab environment. This can save time and resource during malware investigation. In addition, Windows Defender Exploit Guard can be useful in finding malicious shellcodes that traverse export address tables. Windows Defender Exploit Guard can be an excellent tool for finding and blocking malware and exploit activities. Windows Defender Exploit Guard events are surfaced in the Windows Defender ATP portal, which integrates protections from other Microsoft solutions, including Windows Defender AV and Windows Defender Application Guard. This integrated security management experience makes Windows Defender ATP a comprehensive solution for detecting and responding to a wide range of malicious activities across the network. Windows 10 S, a special configuration of Windows 10, locks down devices against Dofoil and other attacks by working exclusively with apps from the Microsoft Store and using Microsoft Edge as the default browser. This streamlined, Microsoft-verified platform seals common malware entry points. To test how Windows Defender ATP can help your organization detect, investigate, and respond to advanced attacks, sign up for a free trial. The surge in Bitcoin prices has driven widescale interest in cryptocurrencies. While the future of digital currencies is uncertain, they are shaking up the cybersecurity landscape as they continue to influence the intent and nature of attacks. Cybercriminals gave cryptocurrencies a bad name when ransomware started instructing victims to pay ransom in the form of digital currencies, most notably Bitcoin, the first and most popular of these currencies. It was not an unexpected move digital currencies provide the anonymity that cybercriminals desire. The sharp increase in the value of digital currencies is a windfall for cybercriminals who have successfully extorted Bitcoins from ransomware victims. These dynamics are driving cybercriminal activity related to cryptocurrencies and have led to an explosion of cryptocurrency miners (also called cryptominers or coin miners) in various forms. Mining is the process of running complex mathematical calculations necessary to maintain the blockchain ledger. This process rewards coins but requires significant computing resources. Coin miners are not inherently malicious. Some individuals and organizations invest in hardware and electric power for legitimate coin mining operations. However, others are looking for alternative sources of computing power; as a result, some coin miners find their way into corporate networks. While not malicious, these coin miners are not wanted in enterprise environments because they eat up precious computing resources. As expected, cybercriminals see an opportunity to make money and they customize coin miners for malicious intents. Crooks then run malware campaigns that distribute, install, and run the trojanized miners at the expense of other peoples computing resources. 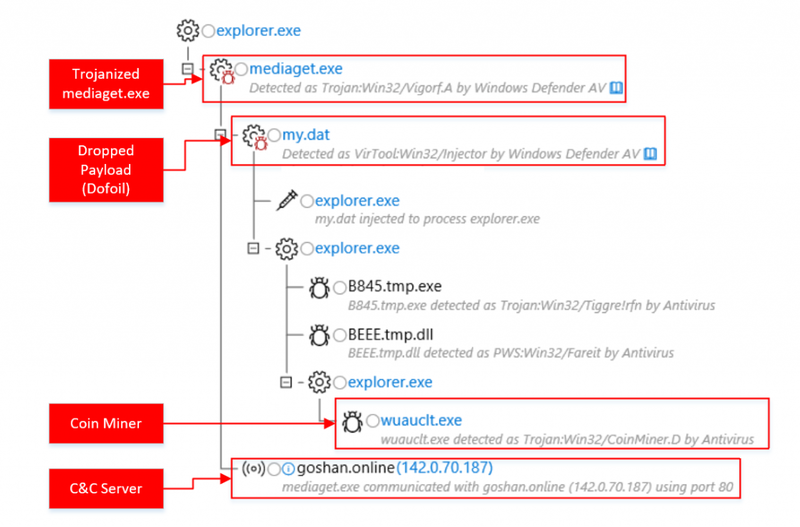 On March 6, Windows Defender Advanced Threat Protection (Windows Defender ATP) blocked a massive coin mining campaign from the operators of Dofoil (also known as Smoke Loader). In enterprise environments, Windows Defender ATP provides the next-gen security features, behavioral analysis, and cloud-powered machine learning to help protect against the increasing threats of coin miners: Trojanized miners, mining scripts hosted in websites, and even legitimate but unauthorized coin mining applications. Cybercriminals repackage or modify existing miners and then use social engineering, dropper malware, or exploits to distribute and install the trojanized cryptocurrency miners on target computers. Every month from September 2017 to January 2018, an average of 644,000 unique computers encountered coin mining malware. Interestingly, the proliferation of malicious cryptocurrency miners coincide with a decrease in the volume of ransomware. Are these two trends related? Are cybercriminals shifting their focus to cryptocurrency miners as primary source of income? Its not likely that cybercriminals will completely abandon ransomware operations any time soon, but the increase in trojanized cryptocurrency miners indicates that attackers are definitely exploring the possibilities of this newer method of illicitly earning money. We have seen a wide range of malicious cryptocurrency miners, some of them incorporating more sophisticated mechanisms to infect targets, including the use of exploits or self-distributing malware. We have also observed that established malware families long associated with certain modus operandi, such as banking trojans, have started to include coin mining routines in recent variants. These developments indicate widespread cybercriminal interest in coin mining, with various attackers and cybercriminal groups launching attacks. The downward trend in ransomware encounters may be due to an observed shift in the payload of one of its primary infection vectors: exploit kits. Even though there has been a continuous decrease in the volume of exploit kit activity since 2016, these kits, which are available as a service in cybercriminal underground markets, are now also being used to distribute coin miners. Before ransomware, exploit kits were known to deploy banking trojans. DDE exploits, which have also been known to distribute ransomware, are now delivering miners. For example, a sample of the malware detected as Trojan:Win32/Coinminer (SHA-256: 7213cbbb1a634d780f9bb861418eb262f58954e6e5dca09ca50c1e1324451293) is installed by Exploit:O97M/DDEDownloader.PA, a Word document that contains the DDE exploit. The exploit launches a cmdlet that executes a malicious PowerShell script (Trojan:PowerShell/Maponeir.A), which then downloads the trojanized miner: a modified version of the miner XMRig, which mines Monero cryptocurrency. Other miners use reliable social engineering tactics to infect machines. Cybercriminals have been distributing a file called flashupdate, masquerading the file as the Flash Player. The download link itselfseen in spam campaigns and malicious websitesalso uses the string flashplayer. Detected as Trojan:Win32/Coinminer, this trojanized coin miner (SHA-256 abbf959ac30d23cf2882ec223966b0b8c30ae85415ccfc41a5924b29cd6bd4db) likewise uses a modified version of the XMRig miner. For cryptocurrency miners, persistence is a key element. The longer they stay memory-resident and undetected, the longer they can mine using stolen computer resources. While more traditional persistence mechanisms like scheduled tasks and autostart registry entries are common, cybercriminals can also use more advanced methods like code injection and other fileless techniques, which can allow them to evade detection. 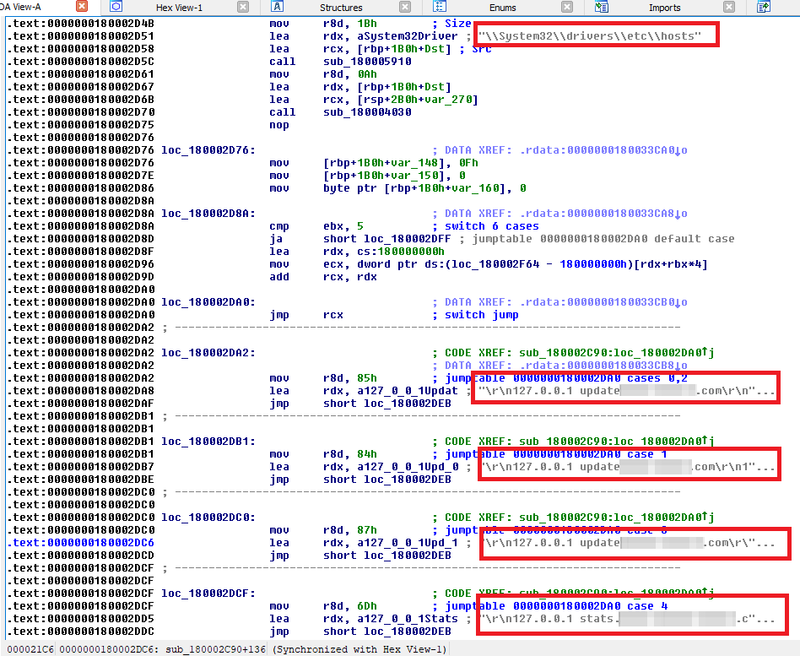 One example of coin mining malware that uses code injection is a miner detected as Trojan:Win32/CoinMiner.BW!bit (SHA-256: f9c67313230bfc45ba8ffe5e6abeb8b7dc2eddc99c9cebc111fcd7c50d11dc80), which spawns an instance of notepad.exe and then injects its code. Once in memory, it uses some binaries related to legitimate cryptocurrency miners but runs them using specific parameters so that coins are sent to the attackers wallet. We also came across a malicious PowerShell script, detected as TrojanDownloader:PowerShell/CoinMiner (SHA-256: 5d7e0fcf45004a7a4e27dd42c131bcebfea04f14540bd0f17635505b42a96d6e), that downloads mining code that it executes using its own parameters. It adds a scheduled task so that it runs every time the computer starts. Some coin miners have other capabilities. For example, a miner detected as Worm:Win32/NeksMiner.A (SHA-256: 80f098ac43f17dbd0f7bb6bad719cc204ef76015cbcdae7b28227c4471d99238) drops a copy in the root folder of all available drives, including mapped network drives and removable drives, allowing it to spread as these drives are accessed using other computers. It then runs legitimate cryptocurrency miners but using its own parameters. As trojanized cryptocurrency miners continue evolving to become the monetization tool of choice for cybercriminals, we can expect the miners to incorporate more behaviors from established threat types. Coin mining scripts hosted on websites introduced a new class of browser-based threats a few years ago. The increased interest in cryptocurrencies has intensified this trend. When the said websites are accessed, the malicious scripts mine coins using the visiting devices computing power. While some websites claim legitimacy by prompting the visitor to allow the coin mining script to run, others are more dubious. Some of these websites, usually video streaming sites, appear to have been set up by cybercriminals specifically for coin mining purposes. Others have been compromised and injected with the offending scripts. One such coin miner is hidden in multiple layers of iframes. We have also seen have seen tech support scam websites that double as coin miners. Tech support scam websites employ techniques that can make it difficult to close the browser. Meanwhile, a coin mining script runs in the background and uses computer resources. On top of malware and malicious websites, enterprises face the threat of another form of cryptocurrency miners: legitimate but unauthorized miners that employees and other parties sneak in to take advantage of sizable processing power in enterprise environments. While the presence of these miners in corporate networks dont necessarily indicate a bigger attack, they are becoming a corporate issue because they consume precious computing resources that are meant for critical business processes. Miners in corporate networks also result in additional energy consumption, leading to unnecessary costs. Unlike their trojanized counterparts, which arrive through known infection methods, non-malicious but unauthorized cryptocurrency miners might be trickier to detect and block. In January 2018, Windows enterprise customers who have enabled the potentially unwanted application (PUA) protection feature encountered coin miners in more than 1,800 enterprise machines, a huge jump from the months prior. We expect this number to grow exponentially as we heighten our crackdown on these unwanted applications. While non-malicious, miners classified as potentially unwanted applications (PUA) are typically unauthorized for use in enterprise environments because they can adversely affect computer performance and responsiveness. In contrast, trojanized miners are classified as malware; as such, they are automatically detected and blocked by Microsoft security products. Potentially unwanted applications are further differentiated from unwanted software, which are also considered malicious because they alter your Windows experience without your consent or control. PUA protection is enabled by default in System Center Configuration Manager. Security administrators can also enable and configure the PUA protection feature using PowerShell cmdlets or Microsoft Intune. Windows Defender AV blocks potentially unwanted applications when a user attempts to download or install the application and if the program file meets one of several conditions. Potentially unwanted applications that are blocked appear in the quarantine list in the Windows Defender Security Center app. In September 2017, around 2% of potentially unwanted applications blocked by Windows Defender AV are coin miners. This figure has increased to around 6% in January 2018, another indication of the increase of these unwanted applications in corporate networks. Windows 10 Enterprise customers benefit from Windows Defender Advanced Threat Protection, a wide and robust set of security features and capabilities that help prevent coin minters and other malware. Windows Defender AV uses multiple layers of protection to detect new and emerging threats. Non-malicious but unauthorized miners can be blocked using the PUA protection feature in Windows Defender AV. Enterprises can also use Windows Defender Application Control to set code integrity policies that prevent employees from installing malicious and unauthorized applications. Trojanized cryptocurrency miners are blocked by the same machine learning technologies, behavior-based detection algorithms, generics, and heuristics that allow Window Defender AV to detect most malware at first sight and even stop malware outbreaks, such as the massive Dofoil coin miner campaign. By leveraging Antimalware Scan Interface (AMSI), which provides the capability to inspect script malware even with multiple layers of obfuscation, Windows Defender AV can also detect script-based coin miners. Coin mining malware with more sophisticated behaviors or arrival methods like DDE exploit and malicious scripts launched from email or Office apps can be mitigated using Windows Defender Exploit Guard, particularly its Attack surface reduction and Exploit protection features. Malicious websites that host coin miners, such as tech support scam pages with mining scripts, can be blocked by Microsoft Edge using Windows Defender SmartScreen and Windows Defender AV. Corporate networks face the threat of both non-malicious and trojanized cryptocurrency miners. Windows 10 S, a special configuration of Windows 10, can help prevent threats like coin miners and other malware by working exclusively with apps from the Microsoft Store and by using Microsoft Edge as the default browser, providing Microsoft-verified security. Security operations personnel can use the advanced behavioral and machine learning detection libraries in Windows Defender Endpoint Detection and Response (Windows Defender EDR) to detect coin mining activity and other anomalies in the network. Windows Defender EDR integrates detections from Windows Defender AV, Windows Defender Exploit Guard, and other Microsoft security products, providing seamless security management that can allow security operations personnel to centrally detect and respond to cryptocurrency miners and other threats in the network. Do you use parental controls?